COLLEGE STATION – The new Doug Pitcock ’49 Texas A&M Hotel and Conference Center is nearing completion (www.TexasAMHotelCC.com​)​. Scheduled to open in August 2018, the 252,500-sf property will serve as a gateway to the university’s exceptional academic, research, cultural and athletic resources. 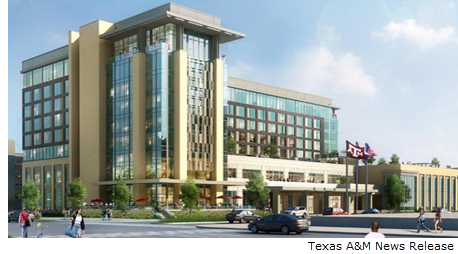 The eight-story hotel and conference center is across the street from Kyle Field, home of the Texas A&M football team, and steps from the Memorial Student Center. In addition, the conference center spans across 35,000 sf of meeting and event space that includes a soaring 8,300-sf ballroom accommodating up to 1,000 guests, and outdoor spaces. The hotel will include 250 guest rooms with two penthouses and 11 suites. A 1,400-car parking garage will be connected to the hotel by a covered bridgeway.